We’ll automatically send you a daily prospect activity summary report, but you can get a weekly version if you prefer. These reports detail your active prospects and the pages they visited. 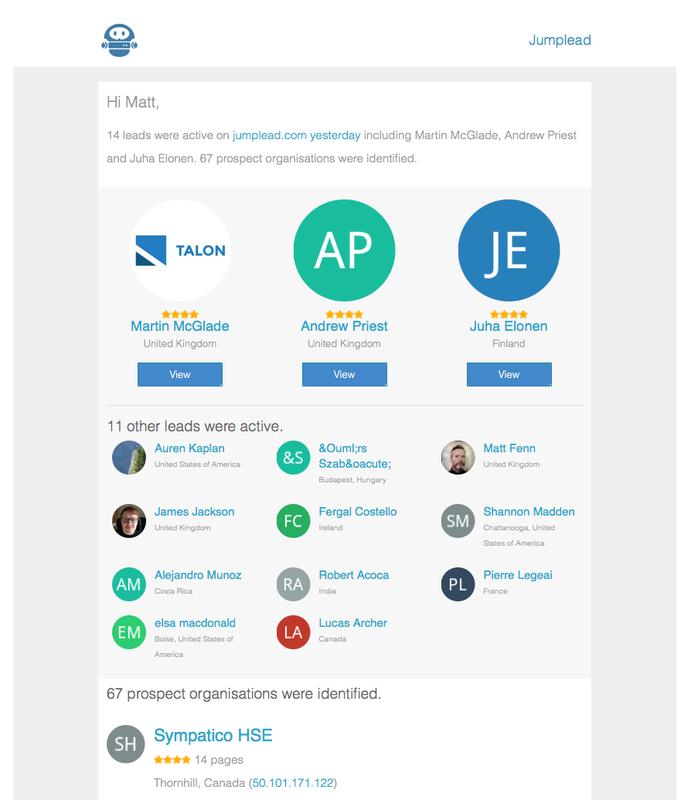 Use these reports to keep your sales team up to date with which leads are active and engaged. The report will include the activity of leads that have converted on your Jumplead forms or landing pages or clicked through from your Jumplead email campaigns. If there are no active contacts, the email summary will show active organisations, identified by their IP address. Your email lead summary is a good daily indicator of how well you are doing at converting new leads and re-engaging existing leads. Tip: If you are not seeing active individual contacts you should be looking at how you can improve your conversion offers and generate click throughs from your emails, driving contacts back to your website and increasing their level of qualification.